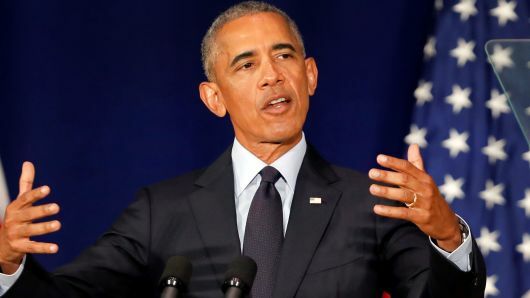 After over a year of staying out of the political spotlight, former president Barack Obama has once again stepped to center stage. Accepting the Paul H. Douglas award for Ethics in Government (which recognizes officials who promote the highest standards of public service) at the University of Illinois on Friday, September 7, he gave a speech covering the current state of politics, Trump, and the importance of voting in the upcoming midterm elections. Obama notes in his speech that our current political system is run by the powerful and the privileged, people who are insistent on keeping citizens divided and angry in order to maintain their status quo and their power and privilege. It is run by people who manipulate the government with their wealth to make sure legislation is passed for their benefit instead of the country’s. As Obama stated in his speech, this did not start with Donald Trump, he is simply capitalizing on what resentful politicians have been fanning for years. In his powerful speech, Obama goes on to illustrate just how Trump, whose administration currently has no checks and balances, has been on the current state of democracy. Trump has been appealing to fears, pitting groups of people against each other, undermining our alliances, getting close to Russia, threatening the press, etc. That is not what Lincoln had in mind when he helped form the republican party – this is radicalism. The former president insisted that this should not be a fight between Democrats and Republicans, as both parties have been infected with such negative politics at some point in history. However, he cannot neglect the fact that, “over the last few decades, the politics of division and resentment and paranoia has found a home in the Republican party.” The former President insisted that whether you are a Democrat or a Republican, you should be able to recognize that the president should not call upon the FBI or the attorney general whenever a member of his party is in danger of prosecution. You should recognize that the president should not threaten the press because they said something he did not like. You should recognize that the president should not target certain groups because of how they look or who they pray to. Obama insists that whether you are a Democrat or a republican, you should know that this is not how our democracy works and that “we are Americans, we’re supposed to stand up to bullies, not follow them.”. Former President, Barack Obama, offers a possible solution to the failing state of our democracy in his speech, to VOTE. In two months time, the midterm elections will be upon us and it will be up to us to vote in order to change the course of our political arena. When we stop paying attention, become disengaged, and don’t vote, we are allowing other voices to fill the void; voices that bring about politics of fear and resentment. Obama urges us to go out, pay attention, and vote – because the biggest threat to our democracy is indifference. The progress towards bettering democracy will not happen all at once, but standing up, engaging, and voting is a step in the right direction.